South San Francisco, CA, Nov. 9, 2018 – NGM Biopharmaceuticals, Inc., a clinical stage biotechnology company focused on harnessing powerful biology to develop transformative therapeutics for patients, today announced preliminary histology data from open-label, single-blind, dose-finding expansion cohorts of its Phase 2 study evaluating its lead product candidate, NGM282, in patients with nonalcoholic steatohepatitis (NASH). This ongoing, adaptive Phase 2 trial is evaluating the efficacy, safety and tolerability of daily subcutaneous injections of 0.3 mg, 1 mg, 3 mg and 6 mg of NGM282, an investigational engineered version of the human hormone known as fibroblast growth factor 19 (FGF19), in patients with biopsy-confirmed NASH. 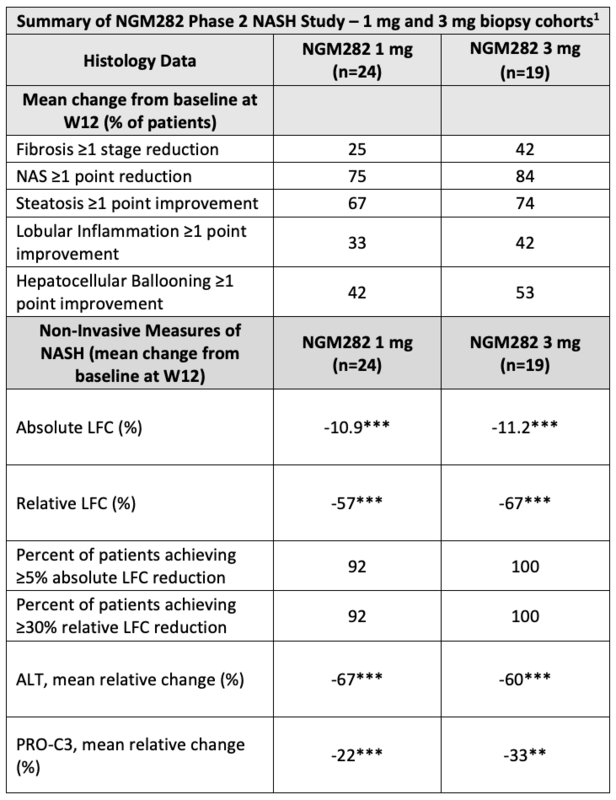 The new data reveal that treatment with 1 mg doses of NGM282 resulted in a rapid and robust impact on both fibrosis stage and disease activity as measured by the non-alcoholic fatty liver disease (NAFLD) activity score (NAS) at 12 weeks. These findings are consistent with data from the NGM282 3 mg biopsy cohort presented earlier this year at EASL’s The International Liver Congress in Paris. The new 1 mg biopsy cohort data will be presented during an oral session at 2:15 p.m. PST on Sunday, November 11 at AASLD’s The Liver Meeting, which is taking place November 9-13, 2018 in San Francisco. NGM282 1 mg and 3 mg demonstrated a favorable safety and tolerability profile consistent with prior clinical studies. Consistent with the drug’s mechanism of action and potent inhibition of CYP7A1, LDL-C increased by a similar magnitude above baseline with both study groups but was reduced below baseline levels within two to four weeks by administration of a statin. The most common adverse events were mild gastrointestinal symptoms (nausea, loose/frequent stools) and injection site erythema that resolved during the treatment phase. In the two biopsy study cohorts, there were five serious adverse events, none of which was deemed to be related to treatment by the investigator.